Central College will travel to Europe this week with Global Football for a fifth time when the Dutch tour Austria, Germany and the Swiss Alps and take on one of the continent’s American football powerhouses. 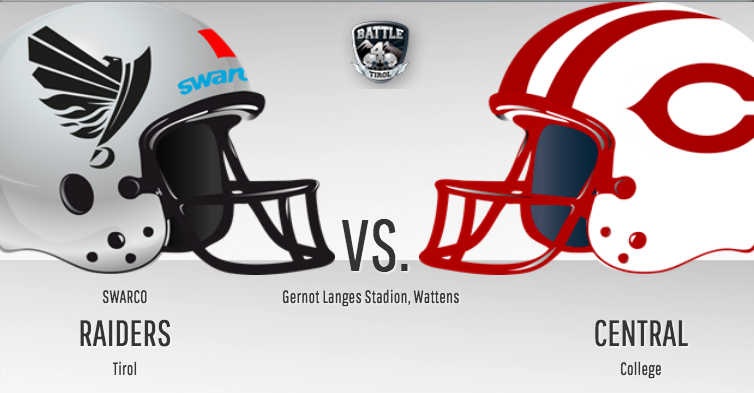 Coach Jeff McMartin’s Central Dutch will face the Swarco Raiders Tirol at the Tivoli Stadium in Innsbruck on Friday, May 25 at 6.30pm local time (12.30pm U.S. ET) in a match-up of two teams that are accustomed to success. The game will be streamed live at www.RaidersTV.at. The Raiders were formed in 1992 and have won the continent’s most coveted American football prize the Eurobowl on three occasions and the Austrian Bowl five times, most recently in 2015 and 2016 under current head coach Shuan Fatah, while finishing as runners up in 2017. In a unique arrangement, the Raiders have partnered with the Oakland Raiders of the NFL since 2008 and both sides share experiences and information on and off the field. Swarco Raiders have an impressive pedigree against visiting American college teams. They beat the NCAA D-III Elmhurst Bluejays 24-10 in 2016 and last year led Benedictine College before surrendering a 13-point third quarter lead in a narrow 31-27 defeat. The Dutch have finished in the top three in the league 13 times in the past 14 years under McMartin, with nine top-10 placings, including 2016 and 2017. Central’s 30 league titles and the school’s 20 NCAA Division III playoff berths are the third most in the nation. The Dutch have compiled 17 undefeated regular seasons and have not had a losing football campaign since 1960. When not focusing on football, the Dutch traveling party will visit Munich, Innsbruck and the Swiss Alps from May 21 to 29, starting their tour with brunch at Munich’s famous city center, the Viktualienmarkt, before heading out on a Munich orientation walking tour. They will enjoy a welcome dinner at the Rateskeller Restaurant for a truly authentic Bavarian experience. The overseas experience includes a visit to the Dachau Memorial, tours of Innsbruck and the Neuschwanstien Castle a Trummelback Waterfalls walking tour and hike, white water rafting and canyoning. The Global Football coordinator accompanying Central College to Europe is Mike Working, who 22 years ago was the first-ever client of the Texas-based sports travel leaders when he took Mount Saint Joseph (MD) High School to tour London and play a game in the UK.